Of course, this is fair, to some degree (see what I did there?). In all seriousness, most college students are young. They haven’t had a lot of time to accumulate wealth. Most are inexperienced. They haven’t learned as much about wealth accumulation and investing. Despite all of this, many still have tremendous financial responsibilities. Between courses, living arrangements and other demands, it’s no secret college students are spending a lot of money. It’s also no secret that college graduates face an uphill climb these days. While there are reasons to believe that the job market is getting better, what you do in college will still affect you for the rest of your life. Amongst other things, this should highlight the need to begin financial planning in college. According to a Gallup poll on budgeting from a few years back, only a third of Americans have one. Begin making healthy financial decisions now and you’ll be better able to make them throughout your 20s and even effectively plan for retirement. That said, the following financial tips for college students should help with keeping serious money problems at bay. As we just mentioned, most people don’t keep a budget. Budgeting for college students shouldn’t be a problem because of how important it is, but also because this kind of technology makes it so incredibly simple to do. These apps will monitor your spending, create a budget based on your habits and then help you curtail your expenditures so you keep more of your hard-earned cash. Almost all of the heavy lifting is done for you. One of the most overlooked financial tips for college students is to use their classmates and roommates for help. College often gets a bad reputation for the prevalence of peer pressure, but no one ever talks about how this can be used for good. Chances are that you’re not the only one who wants to make smart financial decisions. Find others in the same boat by becoming accountability partners. This can work a number of different ways. For example, if you’re good friends with your roommate, ask them to keep an eye on your purchasing. Give them permission to scrutinize any new purchases. You can even ask them to keep you accountable for your budget by taking the amount you’ve allotted yourself out of the ATM at the beginning of the week. Then, give them your ATM card with strict instructions that you’re not allowed to have it back until it’s time for another pre-approved withdrawal. There are countless other ways you could do this, but the point is that you’re not alone and shouldn’t forego such a helpful asset. 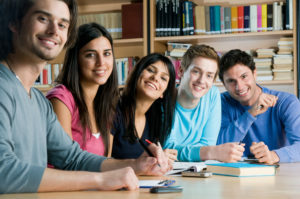 Financial planning in college is much easier with the help of your friends. Horror stories abound about college students who ruined their finances with credit cards. There’s no doubt that these little pieces of plastic can quickly become financially fatal. I don’t completely recommend against them, though. For one thing, credit cards help build good credit. That’s something I think more financial tips for college students should cover, too, because good credit goes a long way throughout life. The problem, of course, is that credit cards can quickly allow your spending to get out of control. My suggestion is to use your credit card to pay for a reoccurring, manageable expense like your phone bill. Just make sure you pay off the balance every month – no exceptions! One area where budgeting for college students sometimes seems impossible is textbooks. They each cost a small fortune and they’re generally useless after a single semester. Aside from the rare exceptions when you need the newest edition that just came out, always buy used textbooks. Start looking the moment you know which ones you need. Most colleges now have book exchanges. I’d also recommend looking online. Amazon and other sites are often selling textbooks for a fraction of what they cost at a campus bookstore. Furthermore, when you’re done with your book, sell it to a student. You can charge more than what you’d get from the bookstore, yet they’ll still end up paying less. If you’d like even more financial tips for college students or want help managing your funds during this challenging time, Mooney Lyons is here to help. Contact us today and we’d be happy to sit down with you (or your son or daughter) to put a plan together.